Today’s my braces update and I’m happy to celebrate I have survived *six* full months now, lol. 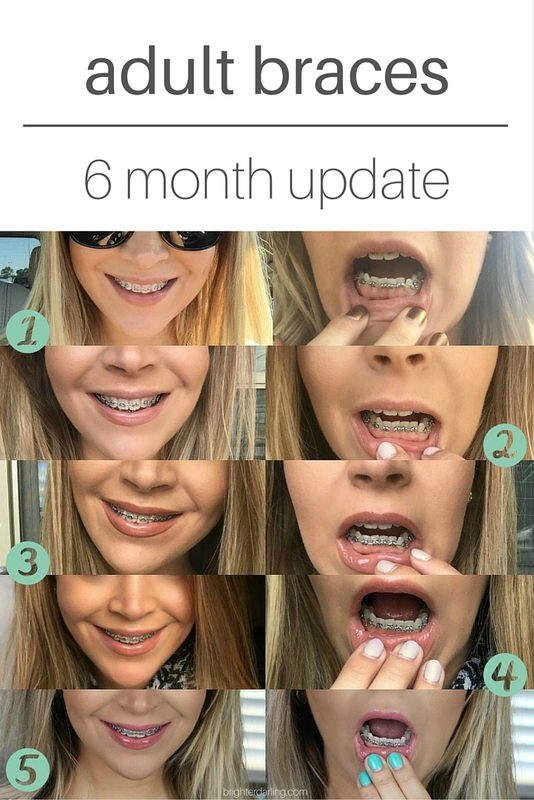 I mainly wanted to visually share how things have developed in this official 6 month braces update by piecing together all of my update photos into one, as well as, give a quick debriefing on what’s happened since last check in. Click here to see last month’s aerial shots. Honestly, this may be the most boring braces post I hope to make until we get closer to the end, but again this month – there’s been 0 change to my top teeth since we’re STILL working on the bottom (as discussed last month). I didn’t get rubber bands as I had hoped and we kept the same strength wire on the bottom (so both top/bottom are on their 4th wire overall). Wire ties on those bottom teeth were replaced/tightened, as well. My ortho lightly filed between my bottom two middle teeth to check if there’s even enough space to straighten those teeth out, but he’s extremely conservative with movement/progress, so although I have seen some minor progress this month, I am not sure if it’s going to be enough to add rubber bands yet (#sadface/#fingerscrossed). For those like me who don’t really understand what a cross bite is, here’s a close up of my teeth as of today (6 months). Although the teeth themselves are looking more straight, you can see my bite is off. The more proper (although not perfect) alignment is seen on (my) right, where the top teeth slightly overlap the bottom. 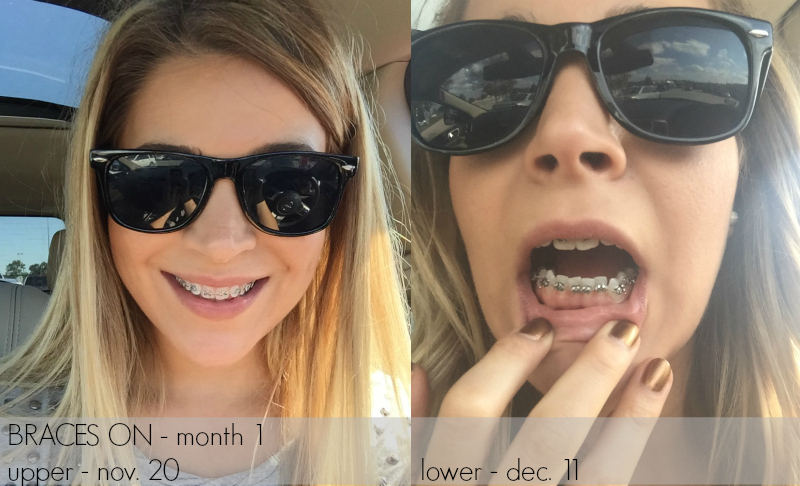 Have you ever been frustrated with your braces progress or had a similar situation? Let me know in the comments so we can commiserate together. I’d also welcome any inspirational feedback, as I’m definitely less-than-thrilled with my lovely little oral train tracks this month. As always, if you don’t feel comfortable leaving a comment, my email is brighterdarling@gmail.com. That concludes my (uneventful) 6 month braces update. 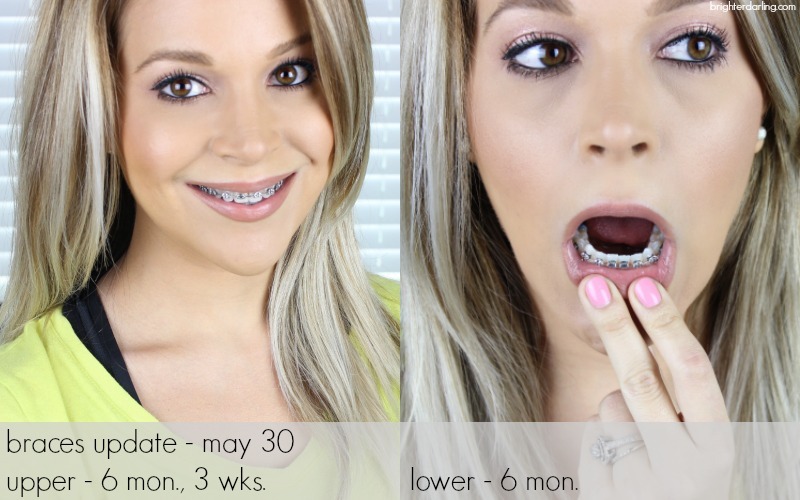 Check back on June 27th for my 7 month update and some info on the health advantages of getting adult braces (there are quite a few)! "Hair Recipes Review | Shampoo, Conditioner + Hair Oil"
"Updated Skin Care Routine | Battling Breakouts + Fine Lines"